It's been a quiet week with Roger losing early in Rome but with Djokovic dismissing Raonic and Nadal schooling Dimitrov to setup another mouthwatering final I decided to tune in. As usual I wasn't disappointed as Djokovic came from a set down to defeat Nadal 4-6 6-3 6-3 and win his 5th Masters 1000 tournament out of the last 6 he has played in. That's quite an incredible run of form and Djokovic continues to grow and grow on me. As a Fed fan you just have to appreciate what he is able to do against Dull on a clay court. This is a Djokovic that's playing his first tournament back since an injury too who's looked a little ropey this week. First of all he takes out Raonic who was playing one of his best ever matches and then he comes from a set down to beat one of his main rivals on their preferred surface. Pretty special. The first set Djokovic was never at the races and as you'd expect Nadal took full advantage of it to take the lead. This guy is probably the best opportunist in tennis of all time, he just smells weakness and goes for the kill. In the second though things changed and Djokovic began to strike the ball much better off both wings, he had Nadal pinned behind the baseline constantly on the defensive. There was a shaky moment when he got broken back at 3-1 despite leading 40-0 but he regrouped to break again and serve the set out 6-3. Momentum was well and truly with the Serb at this point and he again got an early break to give himself the advantage in the final set. Nadal of course keeps running and he took advantage of some slack play to break back again only for Djokovic to break, hold and then break again to win his third Rome title in dominant fashion. An impressive victory and I can see this match being fairly important for future matches too as coming from a set down to win on clay is a real turn up for the books. It's the first time Djokovic has managed to do it on this surface and I can't think of many matches where Nadal has lot on clay when he won the first set if any. Hopefully we get to see them play in a best of 5 at the French Open and it's going to be extremely tough to call. Nadal ground out some impressive victories this week and started to look more and more dangerous but now he's taken another hit in a final against an opponent who has won their last 4 encounters. I'm always surprised when Fed fans say they don't enjoy this rivalry as it's far better than Fedal ever was as it's much more of a level playing field. It's all really down to one shot – the 2 handed backhand which nullifies Nadal's forehand and just remphasises that tennis is about match ups. Fed is the most complete player of all time without a shadow of a doubt but his 1 hander on high bouncing courts that take spin against a lefty is just a bad bad matchup. There's other issues too but purely from a technique standpoint that is a huge factor. The fact he's even beaten Nadal on clay twice is impressive in itself. Next stop is the French Open and Fed will need to be at a high level to make the second week I think. Lack of matches could work against him but he should be able to play himself into the tournament in the first 2 rounds to get that sharpness and competitive edge back. Another pat on the back for Djokovic here too as he stopped Ferrer making the semi finals ensuring that Fed stays at Number 4 ahead of the draw which will be next week. How will Fed do? I'm not really sure as it's a bit of an unknown, he's going to be physically fresh but mentally not that match sharp. This year has been way better than last though so he's got to summon some of the tennis he managed in Dubai and Indian Wells and I think he can make the semi finals. There will most likely be some dangers on the way as Raonic is looking a threat on clay right now and we've big servers like Isner play big matches at the French so the Canadian can't be underestimated. Nishikori could factor too if his body holds up and he's fully recovered from his back injury. I guess no ones expecting you to write about this? Alex, luckyyyy! Hope you have a great day at RG, get to see Roger & of course see him win – hope you’ll bring some comments back to the group! Alex, do you have tickets for all the second round days? Hope you get to see Roger play! Hope you will get to see Roger at RG. Good luck Alex! Thanks Alex, hope you get to see Fed in second round. What day did you get tickets for? Wednesday? nice to see how Djoker dominates rafa on clay. For a FedFan nothing is more enjoyable than this. Definitely fresh physically but mentall won’t be match tough. Hopefully first rounds can just be a nice intro to the tournament. Good job he got 4th seed spot. Federer won from a set down vs Nadal in Hamburg 2007! And it was a bagel last set too!!! Yeah I think maybe Fed and Djoker are the only players to do it? Only them 2 and Zeballos I think beaten him in a final before on clay. Is my assumption that Novak is the first player to beat Nadal four times on clay? *I mean, is it correct? I think so. Fed done it twice I think. Can’t think of any others. Ah good shout with Gaudio. Great backhand but how he won a slam is crazy. The year Henman missed out by choking to Coria. Feds has bageled Nadal on clay, as previously mentioned, grass(Wimbledon 2006) and on the indoor hardcourt(London 2011). Hey guys, great result right? Lets see how Rafa feels now going into RG with not as high confident. Makes him realise what all the others have been feeling for years knowing that Rafa plays his best there. Kudos and so much congrats to Nole. I too like him, then he does something, then I don’t like him, and it goes on and on… But really respect for him. Not easy to defeat Rafa on clay. So hope Roger can do that too, now he sees that everyone, literally everyone from Almagro to Youzhny can do and does the same. Rafa won’t win RG. It is one thing to grind out 3 matches in 3 sets (which, to be honest, kudos to Rafa), but another to win in more than 3 sets in a lot of matches at RG. And…. like I have been saying a lot…. the dude is getting older. Congrats to Novak. First for beating Ferrer. Than that great match against Raonic, who played SO amazing, and now for beating Rafa. To be honest, if it was not so important that Novak won his SF to beat Rafa today, I would actually root for Raonic. He was amazing. Novak has 3 more ATP 1000 titles to go before he overtakes Roger. But honestly… he would deserve that. Congrats to Novak. Hope be can win RG this year if Rog can’t. Thought Rafa was gonna defend. Glad for Djoker and kudos for his heartfelt words re the terrible flooding and fatalitIes in his homeland. Me too, I thought it was too soon back for Djoker to win a M1000 after an injury layoff but he’s come back firing. Obviously the extra week’s layoff was what he needed. That’s good: nobody wants the top players injured going into a Slam. Thanks for the post, Jonathan. I do enjoy watching Djoker beat Nadal esp on clay. The match seemed to be on Djoker’s racket the whole match. It was quite an entertaining match,a little more variety than usual. Djokovic is finally growing up. Raonic is becoming more of a force. He is more than a servebot. The rest of his game keeps improving and he is mentally quite strong esp for his age. Glad Roger will be seeded four at RG. Who knows who will show up. JesusFed, I hope. Raonic served great vs Djoker but he made too many errors late on. Looks like he is improving but physicality is always tough for these big guys. Anything over 6ft 4″ and your’re not cut out for top tier tennis. So true. Too bad we can’t chose our own height. I’m thinking of Rochus, did well considering his height. Six feet – six 3 seems to be the best. I think he said he was tired. Which understandable based on his court time. But then again look at AO 2009, tiredness isn’t usually in his makeup. No, odd, that. Maybe he’s got a touch of mono, or something postviral, or …? OTOH, his court time is under his control, to some extent. Maybe it *is* at least partly psychological. I must admit, I’d really have preferred a different final lineup than “Not them again”, but I’m quite glad Djokovic won, really. I just think that given the farcical Madrid result it would have been pretty unfair for Nadal to win *two* Masters, 2 weeks running. And I too am finding Novak a lot less dislikeable than I used to: I think he’s maturing. How long that attitude will last once he starts the Neanderthal shirt-ripping again, though, I don’t know. Do you think that kind of reaction from Djokovic is a direct result of what Nadal does on the other side of the net? Remember how Almagro reacted recently? I don’t think I’ve ever seen Djokovic rip his shirt against any other opponent. And, is it just me, or has Nadal raised his grunting by several decibels? He is dangerously close to Shriekapova territory. Didn’t Djoker rip his shirt after winning the 2012 WTF? And if Rafa is getting louder with the grunting, that would explain why Roger complained about it so vociferously at the AO this year. Certainly worth celebrating it as a Fed fan as well as a tennis fan. Thanks for the post Jonathan. Agreed with you, I never enjoyed Fedal because it’s usually one-sided unless the side is on Fed. Djokodal whatever called, although not sure I can handle their 5-setters, both are incredible fighters. Yesterday I was especially impressed by Djoker’s aggressive FH, seemed to be much more hostile than before…? I’m with Sue, Nole has been matured, hasn’t he? Good to hear he’s going to donate his prize money to his country’s flood victims. Oh we also should celebrate for the blog having to pass 10,000 fans! You know what I saw yesterday? I don’t know how many years Nole started after Rafa, but Rafa is on 67.000.000 prizemoney and Nole already on 60.000.00 !!! Man, he is becoming rich so fast…..
Not a valid comparison. Prize money has increased DRAMATICALLY over time. Yeah I know 🙂 What would you do if you had so much money Gaurav?? I thought Andy donated his Queen’s money? Don’t think we heard anything about the Wimbledon winnings, did we? But Novak is just a year younger to Nadal & though he started late, nadal has had couple of half seasons missed by injury. At the end of their careers I think Roger, Nadal and Nole could have almost similar prize money, with Djokovic likely edging federer. Hey Alison, didn’t he donate the Wimby money??? Thought I heared Sue Barker say it… Maybe it was the Queen’s money…. Yeah Brain Game is good. I think Djoker’s forehand was on top form and the backhand up the line let him control points. Nadal needs to juice up and add a few mph to his serve a la USO 2010. Congrats! Jonathan…our big family is growing at high rate… and THANKS for the post. Expecting a great performance from Fed in RG. Fingers crossed. I an happy for Djoker as I always like to watch Nadal getting schooled instead of him bashing our poor Roger. No doubt the shot making are not as good as compared to Fedal rivalry but its time Nadal gets a taste of his own medicine getting pound by Djoker on BH side. Nadal’s armour is more dented than before, we might get a new RG champ this year. I pray its Roger but likely for Djoker to win and complete his career GS. Timing for Djoker win at the French feels right but there’s pressure on his shoulders to do it. In my opinion the Federer Djokovic rivalry is far more entertaining than either the Fed- Nadal rivalry or the Nole- Nadal one. I don’t think the Federer Djokovic rivalry gets the credit it deserves. Just my opinion. Probably cause it isn’t Seed 1 against Seed 2 which invariably makes it more of a semifinal billing. Any rivalry is oke and exciting, except 1) Nole/Muzza… kind of boring, play almost the same, long rallies, few risks and unfortunately 2) Roger/Rafa. When Rafa plays Nole, you have 50/50% chance one of them wins. Unfortunately with Roger and Rafa it is about what… 80% that Rafa wil win?? More??? But true, Roger/Nole-rivalry is one of the best. No one (not even Rafa) van push Nole like Roger can…. I just hope Roger and Nole are not in the same half in FO. Roger will be making sure Dull gets his 9th FO title by beating the only guy who can beat him. I agree. Nole Murray is soporific. I disagree- Nadal- Novak isn’t at all 50-50 any more. Maybe on clay. On all other surfaces, I would say it’s 80-20 Novak. 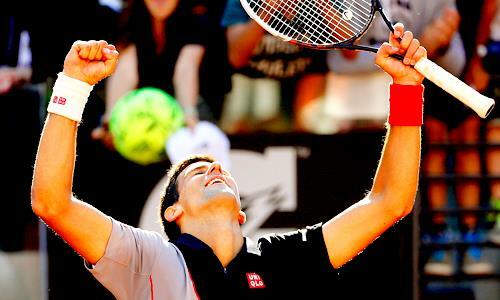 I can only think Nadal might win if Djokovic has an off day like he had in the first set in Rome. Uhmm, Gaurav, what is soporific? Couldn’t find it in the dictionary. Other word for boring or uninterested? Spot on. Soporific- tending to induce drowsiness or sleep. And yeah, I would rather Federer be in Nadal’s half. Either way, he’s going to lose to Nadal if they do end up meeting, however unfortunate that may be, it’s the sad truth. I’d rather he loses in the semis, rather than beating Novak and allowing Nadal to waltz upto yet another French. Nadal is either going to lose to Novak…… or Ferrer…….. or someone like Kei Nishikori……or a someone with a big game who can keep it up for 3 sets (Soderling where art thou!!? ), Murray has the game to bother him. He’s done it on the biggest stages. If it wasn’t clay, I would even favour Murray over Nadal now. Djoker vs Murray is like table tennis or pong. Djokerer is a good one, they match up well and both player can win on a given day. It’s good because Novak stays somewhat offensive even when he’s playing catchup. Nadal is more loopy loop which isn’t that great to watch vs a one hander. How I agree with you, Gaurav. It’s a really good match-up because their games seem to complement each other – and it’s usually around a 50/50 chance for whoever wins. Novak/Andy is like looking in a mirror – or maybe even more boring. And Rafa/Roger tends to be rather a foregone conclusion in most cases. I agree with you Guarev that the Djokerer match up is way better than the other rivalries, the shot making that match up is sublime and the result is down to the wire each time. But still as a die hard Fed fan my favorite match up is still Fedal, even though I know Roger will probably lose and I will be gutted for days afterwards thinking about the defeat, there´s just something speciale in it for me. That special feeling I don´t have in the Djokerer or the Nodal. Maybe it´s the tactical issue where it´s clear to see Roger is thinking tennis and thinking of ways to break down the Nadal defence and mostly don´t succed, or maybe it´s just the hope and wanting of Roger to beat Nadal once more in a slam. And I most say top three of the best matches I have seen is the FeDal match up, specially the Wimbledon 2007-2008 but maybe more Rome in 2006. But I must say the DjokoRinka match up also produces some great matches. I agree, the most watchable in terms of shot making! Btw what has happened to Nadals serve? And FHDTL? His winner count was so poor I thought I was misreading! Serious issues if he is not going to flatten out his shots even a little and go for a winner! I do see parallels with Fed 2008. Longer you play, the more other players find you out; yr play patterns, thought process etc. And more players are getting more comfortable with Rafas baseline game. However, it is apparent that his net play has improved so maybe he needs to play more of a transition game as he gets older….. ps congrats on the Blog J, deserved! Totally parallel Susie. Federer- Nadal at Wimbledon 2006.07/08 seems to be similar to Novak reaching Nadal at the French 2012/13 and now 14. At first unbeatable (Federer on grass, Nadal on Clay) Younger pretender comes along. Pushes opponent to 4 sets, next year 5 and finally manages to win it. I think this is the year Novak wins the French. Jonathan, have you switched allegiance?! Seriously, I enjoyed watching yesterday’s match, and well done Djoko for figuring out how to beat Nadal, whose game is being shown up for what is is more and more these days. You just need to stay tough and not let him bully you into submission. If only Roger could do that, but given the match-up problem it’s a credit to him he’s managed to beat him at all on clay! I also like Djoko more and more. He is like a bendy doll with some of the positions he manages to manoeuvre his body into. I only wish I had the feeling that I knew who he really was and what he’s really like. His personality still seems like an act to me. He is too nice sometimes. It was a good match to watch, Djoker flattened out his shots and hit a ton of winners. Match up at the French is a coin toss I think. You said it! Nadull must do same or he is toast!! I would disagree about the Fedal hype starting after Wimbledon 2008. It began a long time before that – probably after that incredible Miami Masters final in 2005, which Roger won after losing the first 2 sets. And the buzz increased with each time they played on clay the next year – Monte Carlo and the fabulous Rome finals especially. And then when they started playing Wimbledon finals just after RG finals every year, the hype just exploded. I think tennis fans were well aware of their battles at the French, Rome and Hamburg but to casual viewers the 2008 final was where it got big. That final really got a lot of media coverage, the scoreline, the difference in playing styles, Pirate pants vs the clean cut stylish swiss guys, the fact it finished in the dark. For me personally no way is it one of my all time fave matches. Nadal was like 2 points away from a straight sets drubbing, Fed was never in front in the entire match and it ended in almost pitch black. I never get why Fed fans say that’s Fed’ toughest loss. AO 2009 is by far the worst loss but also better to watch. It also shows the Federer / Nadal matchup issue far more clearly than Wimbledon. 2008 was a terrible year for Fed with mono and bad back. 2009 however he played a great AO, had a chance to put Nadal away in the final but didn’t and paid the price. Nadal came in off a 5 set marathon vs Fiasco but summoned endurance yet again in the final and Fed faded badly in the fifth. Their rivalry has played out like that numerous times since. Katyani, I think the pirate pants were all part of an image he wanted to create of being different, aggressive, powerful. He was a bit surly in those days too, before he learnt to be “humble”. The muscles were also a bit overdone for such a young lad. It was an effort to intimidate right from the word go. At least that’s the way I see it. And to think people talk about Roger’s white jacket with the gold lettering as being OTT! Hey Rita, they just mention Roger for anything anyway…. I mean, yes, it might be a little too much with that white jacket with gold, but who knows, maybe he had to because of Nike?? Anyways, when Rafa won RG the 7th or 8th time, did he not also have some kind of special shirt he wore with the number 7 or 8?? Then nobody said anything….. I like the white white jacket with the gold, whoever chose it. Looks regal which suits Roger well. Better than pirate pants any day! Yeah white and gold have been some of his best outfits, 2009 was a top one. Hadn’t seen that, good spot. What I felt for the match is that (1) Nole defended superbly and was determined to move Nadull from side to side; (2) Nole stayed agressive throughout; (3) Nole piled a lot of pressure on Nadull’s serves, 1st and 2nd; and (4) Nole let Nadull know that he could rally all day, though he started moving up to net in the 2nd set onwards with Boris nodding his head. I feel that Roger could also do (1) and (2) reasonably well but often in the past failed in (3) and (4). Roger often blocked serves back to allow Nadull to start rallies and also to control rallies so that Roger often ended on the back foot. Nole in the 2nd and 3rd sets put tremendous pressure on Nadull’s serves. Moreover, Roger’s lack of willingness for trading rallies with Nadull gave Nadull mental advantage. Therefore, if the 2011 RG semi-final Roger turns up, he should bring down Nadull, just like what Nole did in Rome. Mind you, I thought that Nadull played very well, especially some of his best insideout FHs. It was just that Nole gave Nadull very fewer chances to do that. For RG, it will still be in Roger’s own hands. If Roger stays focused and reasonably sharp in the early rounds, he could play himself into form in GF and semi, as you said. Roger’s chance will still be very good IMO. I do hope that Stephen will find a way to help Roger mentally if he meets Nadull in semi again. I am less worried about the technical aspects. I think that Roger’s BH lacks a pace slightly because he does not hit as early as Stan but Roger plays angles very well. 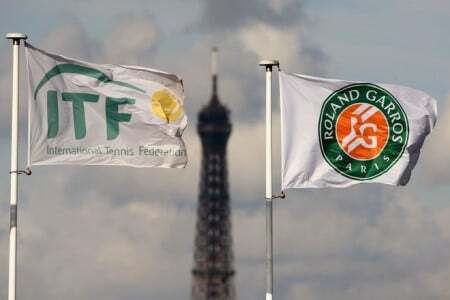 If he is committed to moving Nadull from one tram lines to the other, Roger could have a better chance to pick a spot for final winner, as in some of the sets and matches he won against Nadull in the past. If Nadull paints lines all day and goes for corners all the time for his passing shorts, there won’t be anything for anyone to do but that will be a huge IF. Nadull in his current form is almost guaranteed that will not happen. All good things come to an end – 2014 is Nadull’s turn. If Roger shows enough fight and resiliance as he often did against Nole, Nadull is there for the taking, assuming that he gets there, which is also a sizable IF. Hey Gaurav, I don’t think it’s a good idea to be involved in long rallies against Rafa. Fed needs to cut down the points short. But the problem is if u come to the nets too often, Nadal will pass u most of the times. Bringing Nadal forward?? Will it be a good idea?? More use of drop shots?? Playing to his backhand?? Not giving him many chances for inside out forehand?? Dont know… Just dont know how can our man beat him in RG. It’s a day we all dream about…. @Ankur – they key for Fed is to play aggressive but pull the trigger at right time. Last few matches he started well but once Nadal started getting more balls back he looks to play a big shot too early. Errors balloon and he runs out of ideas. @Simon, I think Nadal is pretty good at the net. Volleying wise he’s not top drawer but pretty safe and usually when he’s at net he’s in control of the point. Just not a great technique. He slides well when trying to pick up balls too. Jonathan, you’ve put it very accurately – Roger pulled a trigger too early/quickly. I just hope that he will be more patient, if they play again. 1. I suspect Roger will go out early-ish. I don’t think he is ready for a grand slam tournament at the moment. 2. Djokovic has all the tools to beat Nadal, but he gets knocked out himself and the tournament opens up again for Rafa to win. As much as I would like a change, I still think that Rafa will walk away with the trophy. Over 5 sets, only one person can beat him, and it is a lot of pressure on Djok’s shoulders. Hey Neil, you know why I think this is Novak’s time to win RG (of course if Roger doesn’t win it)? Because THIS year he is ready. Last year or before that he needed RG to finally get his Career Slam. So, his first and only priority was RG. Didn’t he say that at the beginning of last year? He wants RG so bad. That leads to all the pressure on him. This year, of course he wants RG as badly, but it is not his only priority. So different mindset. Less pressure, more freedom. This year the pressure, I think, is more on Rafa. He is not doing well for his standards. If he loses, he might never win a GS again. If he wins, he definitely might overtake Roger next year. You might be right about Roger: he may still not have settled mentally/emotionally after the birth. We’ll have to wait and see. At least he didn’t do something daft like trying to play Nice/Düsseldorf, which I think would really have unsettled him pre-RG. Looks like he is practising hard. Arrived in Paris well ahead of everyone else. Congrats Jonathan for over 10 ths fans. Imagine many like me not even in it cause we have no FB account! I am a fan of Nole s game too and I also wish he could volley better making him a more complete player. I don’t worry about the pressure he may have . The guy is a mental rock and he beats Nadal in that department too. On a more serious note what happened to Serbia is really terrible and Djokovic is right that it got minimum media coverage. An area and its people that have been through a whole lot of trouble the last couple of decades. Civil war, US bombing them trying (?) to sort things out , huge floods now. I mean what next? Haha, Djoker the Hulk, exactly! Hey GG, nothing wrong with him doing. Just call it ‘a girl thing’ or traditionalism. It’s great to see the emotion after the epic win but I’d rather see the joy in gracious manner. @Gambler – what is the general consensus in Greece for the EU? For me it would appear Greece leaving the EU and going back to their old currency is by far the best option for the long term. Taking the Euro was a terrible idea. Pushers are always tough to put away, but mixing it up and playing some trash yourself usually works. Trying to hit too hard is a recipe for disaster. Serbian floods got zero coverage over here really. Wozniacki and McIlroy got more coverage. You re right Wanda. Jokers celebrations are more like a football player scoring. After all its not that important, just a matter of details. Talking about details and traditionalism, a couple of decades ago it would be like a scandal, a man shaving his chest and legs. Now days things have changed completely, only a few like Roger remain “old school” man types. This sad tennis player called Rafa-Dull. Causing the eyes so much pain. Hi GG, very funny and you are a good poet 🙂 . It will be even better if this is forwarded to die-hard Nadull fans 🙂 . Greece invented democracy, then the EU decided to take it away from them. Federer and Stefan wearing google glasses. So much awesomeness. How can you not love this guy. But damn does he look good with it!! Not sure about glasses. Roger is surely in a very good shape with that tight T-shirt. Wanda, are you reading this 😉 . How about a poem about Roger, Greek Gambler? Gang, it’s not just Wanda that likes the t-shirt! Haha Sue, who wouldn’t like his t-shirts or his chest as a matter? And agree with you, love to read GG’s poem regarding our Roger! If it is for Roger it has to be like Epic poetry . You know , Homer style. Sorry we don’t do epic poetry any more over here . Hard to write, hard to understand and gives too much trouble to children at scools. Limericks you have to deal with something negative or at least some kind of flaw or awkwardness . Ok just because you asked..
…enough know . When does the game begin? when is the draw out ? Hope for an interesting and exiting FO with Roger going deep. Huh?? Roger and Novak on same side of the draw?? Should we be happy or worried?? Nole seems to have an easy draw and Rafa a difficult one if I am reading things correct…. Doesnt look that bad to me . If I get it wright. 1st two rounds look good 3rd a bit tricky but hopefully till then Roger will have taken off already ! Hey GG, yes, seems like Roger has a good draw. But… I think all of them have difficult ones. I mean Djoko vs Raonic?? And looks like Rafa hasn’t got an easy road too, so we will have to see. But…. come on Roger…. this one looks doable. SF will be difficult, but…. doable. I think that Roger’s quarter looks good and also Nole’s quarter is definitively harder, as he will face one of in-form clay court players, Kei or Milos. Where is Jonathan? 🙂 . We are waiting for your draw analysis 🙂 . Charge a quid yearly for members. 10 thousand first memebers get free golden memebership for a life time. Hi guys, draw is out, yaayyy!!!! Roger is winning the French :)! Hey Utch, will Roger begin on Sunday?? What in the WORLD is Roger wearing. I sincerely hope that isn’t his outfit. It looks worse than dreadful. As nice a draw as they come. Nadal has to deal with Ferrer, Stan/ Murray and then Fed/ Djokovic. Would have been even more fun if Gilles Simon and KEI NISHIKORI (!!!) were his 3rd and 4th round opponents, but well, this isn’t too bad now is it! !